Bought this rug from *** for more money. It is beautiful and I was impressed with both the fact that you can throw it in your washing machine AND that it looks like a regular rug. Finally I can have a nice looking rug and my fur baby can not ruin it. I bought a 5 by 7 and loved the look and feel. I purchased another like it in 3 by 5. Now I have my hardwood floor in my bedroom covered. Sunshine loves it because now she does not slip and slide all over. The rugs stay put and I have vacuumed and they are not showing any wear. Now muddy, wet feet do not make me run for cleaner. I can wait for the spot to dry then vacuum and all is well. Someday I will throw them in the washer and have then clean. Maybe next spring! These rugs are great for my senior dog who has had some recent health problems. The rugs give him some traction for moving around on his own giving him some independence, and the tops wash easily in a home front load washer. I have purchased 5 of these rugs in different sizes. This rug arrived right on time, exactly as pictured. You really can’t tell that the top strips off the Velcro-like pad for washing. Perfect for our foyer. Bought this rug for inside my entry. I have a large dog and winter is here! I'd planned on washing this rug when it began showing dirt and stains, but after two months (and several storms) it still looks great. Love the colors and soft texture. 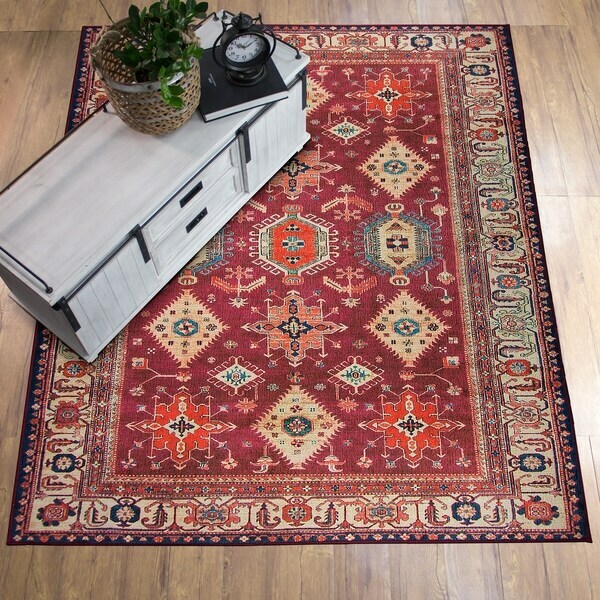 Atypical rug material but looks nice and the fact that it is washable is fantastic. I love it! So nice and easy to pick up & stick in the machine when the dog pees on it. Was tired of her ruining expensive rugs that were heavy & not easy to wash. I have 2 dogs that tromp all over this and it washes up perfectly and it's underlining grips it perfectly. Pretty colors! it washes great and looks great too. THIS IS THE BEST IDEA EVER. The pattern is very up to date which is why I was thrilled to find something that looked super high end pattern wise but was something I could have in my kitchen where it will be getting dirty and needing to be washed. HOW great is this idea!? I couldn't be more excited to see how this works over the coming months. Purchased for my new rv trailer. Gotta have a washable rug!